The Center for Family Support is the first organization in the NY Metropolitan area to have been accredited by The Council on Quality and Leadership (CQL). For more than 40 years CQL has been a leader in working with human service organizations to define, measure and improve the quality of life for all people. 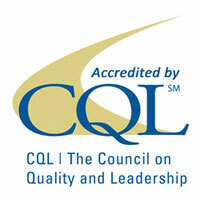 CQL’s Accreditation confirms our focus on excellence in person-centered services and supports. The accreditation is part of our organizational transformation that began more than 10 years ago when we collaborated with Michael Smull, Beth Mount, Michael Callahan and other leaders in the field of person-centered planning. During a week-long site visit, the CQL team met with stakeholders of the organization and helped us identify priorities for the future and develop a What Really Matters Plan. The Quality Improvement Committee is charged with communicating important information to you on a quarterly basis via QUALITY BITS.